Republic of Congo, Democratic Republic of Congo, Tanzania, Zambia, Burundi, Cameroon. It inhabits rivers and lakes, including Lake Tanganyika. 30″ (75cm). It does not usually attain this in the aquarium, but is still easily capable of growing to over 24″ (60cm). Something in the region of 96″ x 36″ x 36″ (240cm x 90cm x 90cm) – 2040 litres, would be required to house an adult specimen. Juveniles can be grown on in smaller tanks, but be warned, this fish grows quickly. 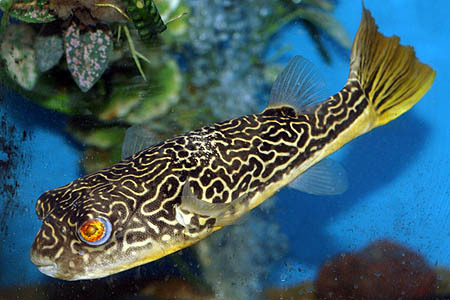 This is a freshwater puffer and does not require the addition of salt to its tank. We suggest a sandy substrate, with smooth rocks and driftwood pieces for decoration. Leave plenty of open space for swimming. You can plant the aquarium if you wish but be prepared for bite marks to appear in the leaves if the puffer spots any morsels of food on them. T. mbu is a molluscivore in nature, and in the aquarium relishes all kinds of shellfish, as well as worms and other live and frozen foods. It should be fed snails and unshelled shellfish (such as crab legs, mussels etc.) regularly, in order to maintain its sharp teeth. As with other puffers, these grow continuously and become a problem for the fish if they are not kept ground down. A generally aggressive and intolerant species that really should be kept alone. Its beak-like mouth can easily bite chunks from other fish, or in extreme cases rip them to pieces. However, some specimens are less aggressive than others and it is down to the individual fish as to how it will react to tankmates. If you decide to take the risk, you will need a huge tank and tankmates that swim too quickly for the puffer to catch them easily. It is also very aggressive towards conspecifics and should never be kept in groups. There are no external sexual differences. Breeding has not occured in aquaria. A truly enormous volume of water would be required for any serious breeding attempt. The giant puffer is also known as the giant green puffer, or simply as the mbu puffer. 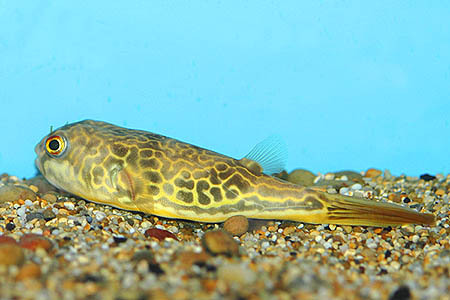 It is an enigmatic species, as not only is it one of the most aggressive puffers available, but it will also learn to interact with its owner, developing into a real pet. Each individual seems to have a unique personality, which is rare among fish. Its eyes appear to show real expression, and its ponderous movements are a joy to watch. It can also change colour, depending on its mood or surroundings. Some specimens will puff up when they want attention, and to see a fully-grown adult inflate to the size of several footballs is an amazing sight. However due to it’s eventual size, it is only really suitable for public aquaria or those few hobbyists able to house it in a suitably sized tank. Sadly, there has been an influx of small, 4-6″ specimens imported over the last few years, and we dread to think what has happened to many of them. If you see this species for sale and are tempted to buy one, please leave it in the store unless you have the facilities and dedication to maintain what is a true aquarium giant.